Do Facebook Ads actually work for eCommerce? The longer answer is yes, they do, but only if you do them right. Facebook Ads can definitely work for e-commerce. The days of just being able to slap up an ad, get clicks for three pence and watch the sales come in are long gone. The Facebook Ad platform is evolving at an incredible rate, and the number of people using it is increasing every minute. That means more complexity, and more competition. Which means it becomes a more difficult nut to crack by the day. To be successful you have to know what you’re doing, do things the right way and look at the big picture. I don’t mean you need to know the latest “secret” or “hack”. I mean you need to have a plan, and make sure all the right elements of a holistic digital campaign or “funnel” are in place to make the most of your ad spend. What’s the one reason you need this funnel? It’s critical to understand your visitors frame of mind when they arrive from a Facebook ad. Facebook is amazing for being able to reach millions of people and really scale your reach. They’re not looking for you. They’re not searching for your products and looking to buy. They’re browsing their friends updates and passing time by watching cat videos or reading Buzzfeed articles, or whatever your customers do. This requires a very different approach than simply showing them your product’s features and benefits. You need to take them on a journey, and interact with them in different ways depending on where they are in the journey. Using interests or lookalike audiences. This might contain two types of targeting and multiple different ads and ad formats. Video works well for this top of the funnel step, but it’s not the only way. To introduce your brand or offer to them. Maybe asking them to sign up to your email list to get an incentive like a discount or free product. 3 – Targeting people who’ve viewed your products but not bought them. A remarketing campaign on Google. Because why just have the products follow your visitors on facebook, when you could stalk them on the whole internet? 🙂 Seriously, you’ve paid to get someone’s attention, you need to make the most of that and have more than one go at convincing them of your brand’s merits. To introduce yourself properly and familiarise your subscribers with what you have to offer. People leave their baskets un-bought for all kinds of reasons – some just get distracted and never come back – a gentle reminder can work wonders to up your conversion rate. Once someone’s bought from you, you want to do your best to keep them as repeat customer, and you certainly want chance to address any issues they have, and perhaps get them to write a review. An automated email is perfect for doing this consistently. This sinister sounding offer is actually great for customers, don’t worry! It’s actually about presenting a new subscriber with an irresistible opportunity to become a customer. Something that’s so good it’s hard to refuse, and tips them from being a subscriber to a customer. Ideally this will be a low price, but high value item – something which is a low risk investment for the customer and makes buying from you an easy decision. This can be tricky for retailers of physical products, but it is possible and works like a dream when you get it right. It might be selling a product at below cost, or even giving it away free if the customer pays for shipping. Why do this? The difference between a subscriber, and a customer who has proven they’re willing to give you money is huge – and once you prove the quality of your product, then your chances of repeat custom seriously increase. A great landing page to convert visitors into subscribers. 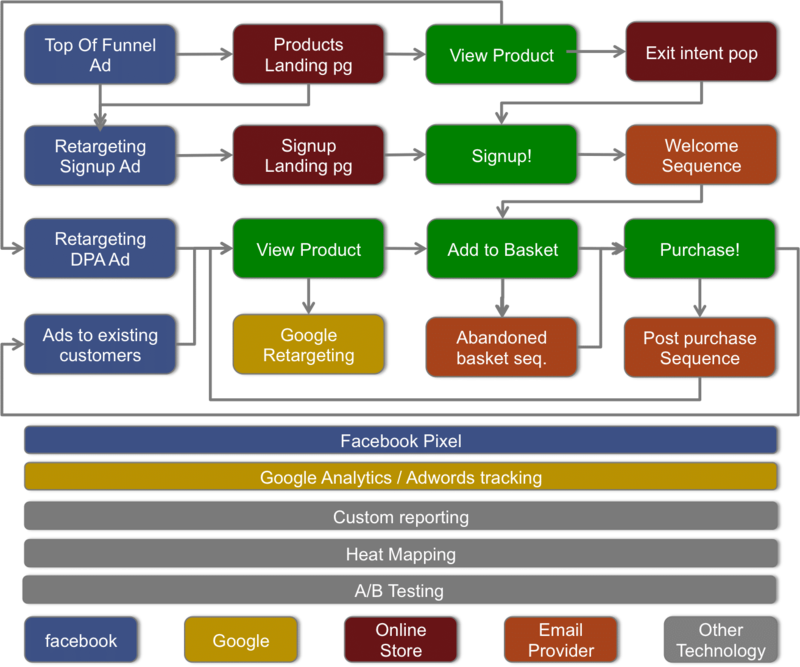 Proper implementation of the Facebook pixel to track visitors, conversions purchases and amounts spent. Without this you can’t retarget, and will have no clue whether your campaign is profitable or a money sink. An exit intent pop up to maximise subscribers with a “before you go” offer. An “upsell” to make sales of your tripwire profitable. Yes, this is what a basic campaign (that works) looks like these days. There’s no denying it looks complicated. But, actually, it’s pretty simple when you think it through. Take a look at this graphic that tries to link all of this together. The more parts of this map you put in place, the better your results will be. None of the individual parts are actually that complex – but each part makes the others more effective. This is what we do at Rethink Business. Integrated digital marketing that actually works. If you’re interested in a real life case study of how we set a funnel like this up for a client, click below. It’s currently returning them 5x their advertising spend every day. Feel free to copy what’s working or ask us about setting this up for you.